VA loans offer some of the best, most competitive loan rates available today. To qualify for a VA loan, you must be a current or former American service member or an eligible surviving spouse. VA loan rates are typically lower than rates offered on conventional or FHA mortgages, regardless of the applicant’s credit score. However, veterans with good to excellent credit scores can get an even better interest rate than those with poor credit scores. Other factors that could affect your VA loan rate include your debt-to-income ratio, the duration of your loan (15-year loans tend to yield better rates than 30-year loans), and, of course, current conditions of the market. Our VA loan rate table shows you current VA loan rates offered by our top-rated VA lenders. 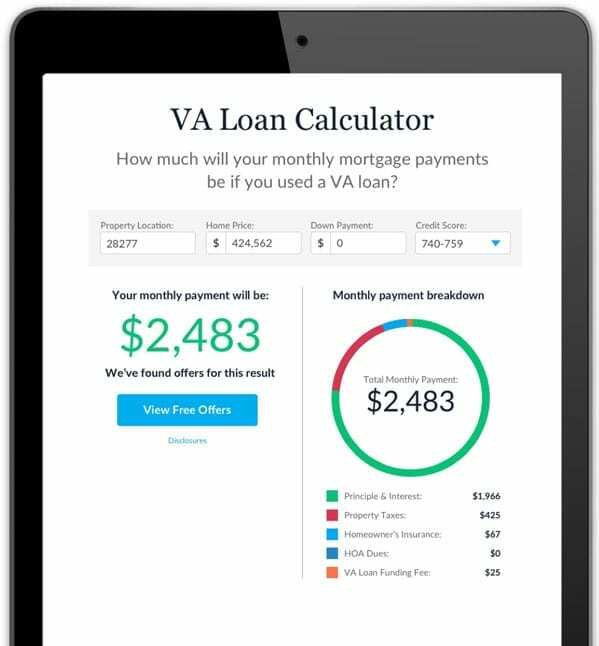 Use our VA loan calculator to estimate your monthly payments and determine the VA loan limit in your area. To make sure your home fits within your budget, simply enter your ZIP code, home price, down payment and credit score to see current VA mortgage rates and estimate your monthly payment. Then we can match you with lenders that will cater to your individual needs.